As Hong Kong lawmakers show increasing leadership in calling for an end to the ivory trade, nearly 100 people took to the streets over the weekend in a peaceful, student-led protest of several ivory retailers - none of whom were displaying valid licenses for their stocks. WildAid's Alex Hofford was on hand to film the rally, Hong Kong's largest to date and the fifth in a series of youth-organized protests in one of the world's largest ivory markets. Over the past year, four Hong Kong retailers pulled ivory products from the shelves following protests outside their stores. 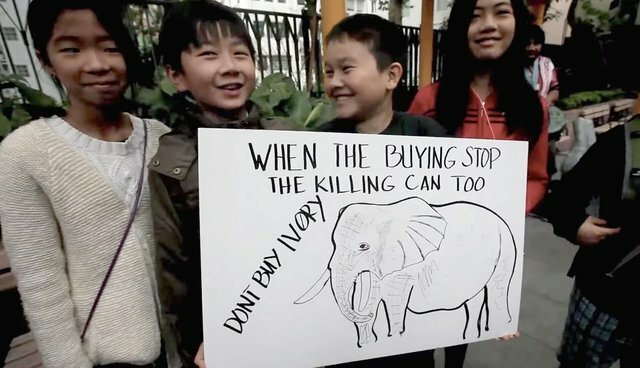 The young activists, ages 10 to 12, held placards and shouted slogans on Saturday as they called for members of the public to stop buying elephant ivory and for the Hong Kong government to ban the city's ivory trade. The students from Hong Kong's ESF Clearwater Bay School, ESF Kennedy School, ESF West Island School and Canadian International School protested several retailers on Hollywood Road and Queen's Road Central in Sheung Wan district. The Hong Kong government requires licensed retailers to display their license to sell ivory obtained prior to the 1989 international ban, but none were visible at these shops. Indeed, some question whether Hong Kong's licensing system accurately reflects the ivory market's actual volume. According to official government figures, Hong Kong's licensees held a total of 117.9 tons in 2013 - a figure that had remained virtually unchanged for the three years since 2010, and then dipping only slightly last year to 111.3 tons. Yet during the same time period, tourism to Hong Kong surged from 30 million to 61 million visitors per year, of which 47 million came from mainland China. Also during the same time period, the amount of smuggled ivory intercepted at Hong Kong ports of entry also grew rapidly. With such a leaky licensing control system in place, banning the sale of ivory in Hong Kong as the students have requested is the best solution to end the ivory trade and the elephant poaching crisis.